More than a year after the launch of the Trans-Atlantic Trade and Investment Partnership (TTIP) talks, negotiators from both sides of the Atlantic still struggle to prove the positive impact of the potential deal, on public health. TTIP has been criticised many times by health NGOs and campaigners for a lack of transparency, as well as for watering down health and consumer legislation, due to the dichotomy between public health and economic interest. Speaking at the European Public Health Alliance’s (EPHA) annual conference in Brussels (5 September) David Taylor, professor of Pharmaceutical and Public Health Policy at the University College London, said that there have been worries that via TTIP, the EU will move closer to the US on the precautionary principle. “Will that be a bad thing? Will we have chlorinated chickens and Frankenstein cows forced down our throats, or will we be forced to be more honest about the scientific basis of what we say is safe or not safe? Maybe it will make some processes more transparent,” Taylor said. Ignacio Garcia-Bercero, from the Commission’s DG TRADE and EU chief negotiator, underlined that the TTIP negotiations are the first free-trade talks where health has been consciously integrated into the policy-making. “We have always been interacting with civil society, but I think with TTIP we have had a greater interaction with health NGOs. We know that these negotiations have an opportunity to promote public health,” Garcia-Bercero told the audience, adding that the most concerns from the civil society have involved public services, the investor-state dispute settlement (ISDS) and intellectual property. Where there are different health regulations between the EU and US, for example on data protection for patients, the different systems will be respected. 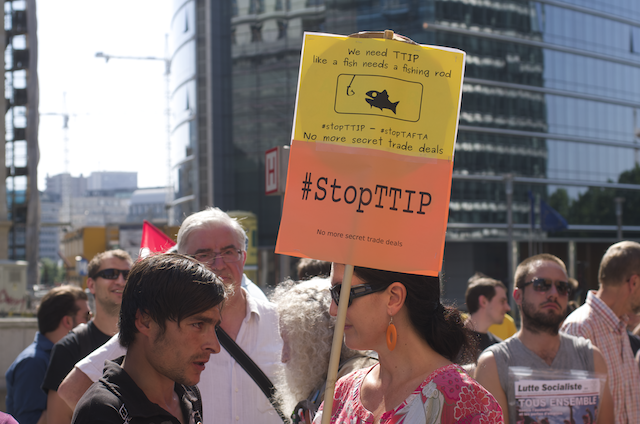 The Commission does not see TTIP as harmonising these rules, the EU chief negotiator said. “We have given many concrete examples about regulatory cooperation that will not only be good in reducing unnecessary costs particularly for small businesses, but we allow the regulators on both sides regarding health to focus their immediate resources where the real risks are. So that will (be the) benefit for health,” Garcia-Bercero stated. Elena Bryan, senior trade representative of the US Mission to the EU, emphasised that the Americans care as much about the right to appropriately regulate and ensuring good food safety, public health, labour environment protection and consumer protection as Europeans. “Sometimes we manifest that a little bit differently because our system of government is different, and we don’t have the same number of languages. But these questions are as important to us as they are to you,” she said. “I have dealt with many trade agreements, but this is really the first of its kind where the two partners are big and evenly matched. This is not an imbalanced negotiation. Two representatives of democratic countries with robust legal and regulatory systems, and the task is to see where there might be space for us to work better together, recognising that we regulate differently, but get to the same end,” the American trade negotiator said. But though some regulation on standardisation could work on both continents, the vast majorities of issues are not win-win, said David Hammerstein, policy chair at Intellectual Property, which represents consumer dialogue and citizens’ organisations in the US and in Europe. “TTIP has caused legislation chill already where many DGs of the Commission are thinking ‘No, we can’t propose or go ahead with this and that’ whether it’ll be chemicals or clinical trial data,” he said. Since then, a new European Parliament has been formed which is markedly more Eurosceptic than the previous one and more likely to oppose free trade. If successful, TTIP would cover more than 40% of global GDP and account for large shares of world trade and foreign direct investment. The EU-US trade relationship is already the biggest in the world. Traded goods and services are worth €2 billion. Brussels and Washington have set the ambitious goal of completing negotiations by the end of 2014. Quoting from the linked article: “the Americans will be very aggressive. They don’t like our approach to public health protection. They will use this opportunity to attack it,” hmm – the reason being that health care in Europe puts the US system to shame & if there is one thing that Americans hate it is being shown that are frankly, shite at doing something. In the case of health care, the USA has, the shitest system and the most expensive system on planet earth, it is designed to cater for the RICH and to disregard the poor – and they want to impose their shite system on Europe. With respect to “Elena Bryan, senior trade representative of the US Mission to the EU” and her claim that “that the Americans care as much about the right to appropriately regulate and ensuring ………public health,…..as Europeans” well the reality of the US health care system shows that Bryan is either a congenital liar, deluded or both. In fairness if she had qualified what she said by saying that the US health care system serves RICH Americans well – then she would have been right. She of course is there to promote the interest of US health care corporations – doubtless a cushy job awaits her with them at some point in the future. The only surprising thing in all this is that Euro bureaucrats are negotiating all this away – for what? & under what mandate? Geez Mike, you took the words right out of mouth. Eurocrats need to take a hard look at the Republican Party in congress over the past three years and see the number of safety programs they have under funded or done away with. Prescription drugs cost a 1000 times more in the US than Europe and this area needs to be open as well. Europeans should also be concerned with the wage famines that corporate America has wrought upon the labor force. Trade treaties need not be negotiated in secrecy unless you plan to screw somebody. I think that is exactly what will happen if this fiasco isn’t killed grave yard dead real soon.